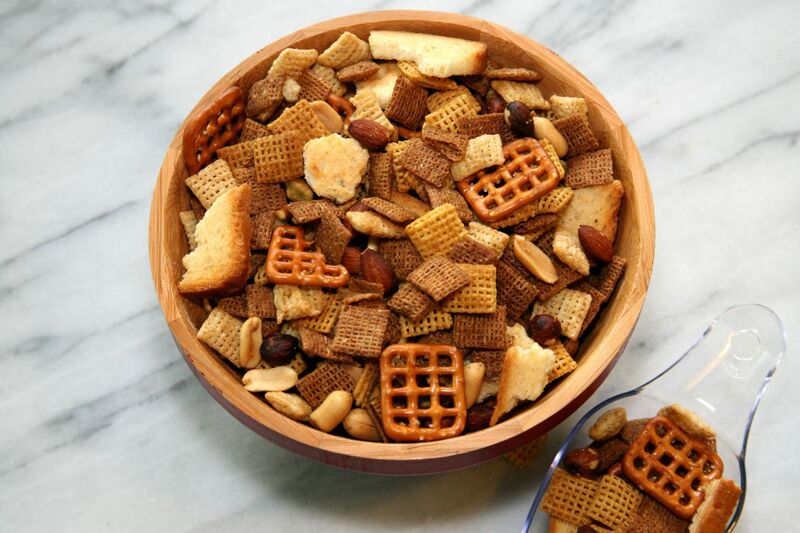 Not only is the chex mix delicious and better than any store bought version I’ve tried, it’s also a breeze to make! I used corn, wheat and rice chex mix, pretzels, mixed nuts and brioche toasts when making ours! We normally use garlic flavored bagel chips rather than brioche toasts, but I couldn’t find them in the store – possibly because I forgot to look in the obvious cracker aisle though that seems doubtful 😉 I bought the toasts from Trader Joes and they were just as good. So choose your favorite base ingredients and check out the recipe below for a great snack to serve at your movie night! Christmas Vacation anyone? I know there’s some fellow Christmas lovers out there who have been playing the movies already just like me! Add butter to a roasting pan, place uncovered in heated oven and allow to melt. Remove pan from oven and add seasonings. Stir until all seasonings are well mixed and resemble a sauce. Add remaining ingredients, gently stirring as you go to evenly coat. Once evenly coated, cover pan with lid and add back to the preheated oven. Bake for one hour, removing and stirring every 15 minutes to prevent sticking. You will stir a total of three times. After an hour, remove chex mix from oven and spread over paper towels to cool. Store in an air tight container. This entry was posted in Recipe Book, Snacks and tagged chex mix, chex mix recipe, cozy home, easy snack recipe, fall recipes, homemade chex mix. Bookmark the permalink.